"Macaroni and cheese is perfect supper food. It's a kids' favorite, and adults like it too. My recipe is simple and almost as quick as the boxed variety. 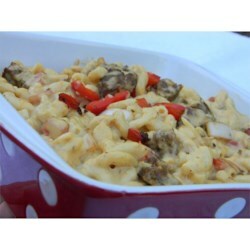 Try this variation with Italian sausage and bell peppers." Follow the recipe for Creamy Macaroni and Cheese. Heat a 10-inch skillet over medium-high heat. Cook sausage, breaking it up as it fries, until it loses its raw color, 3 to 4 minutes. Add onion and pepper slices, and saute until soft, about 5 minutes. Add basil, then stir mixture into macaroni. Serve hot.